FLAMINGO DAY IS HERE! Help us celebrate Marsha's birthday at our annual PINK SALE! This STUNNING quilt is one we are particularly proud of. It's such a prized possession (maybe Marsha's favorite?) that it's only out on display once a year and today is the day! It has a story. 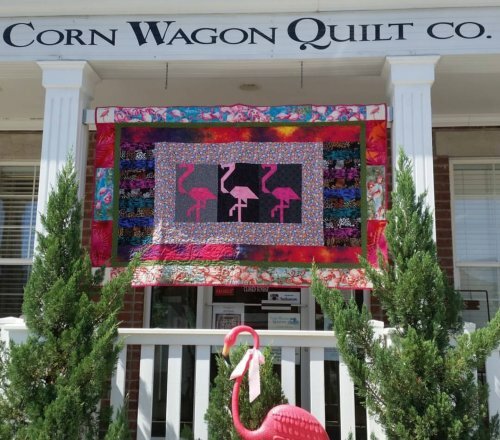 When Marsha first expressed her "fondness" for flamingos in the early years of Corn Wagon Quilt Co, a dear friend (yes, they're still dear friends ) put together these adorable flamingo quilt blocks and generously gifted them to Marsha. Thrilled by the possibilities, Marsha added a tacky-- I mean, tasteful border and graciously gifted the quilt top back to her friend. As you might have guessed, the quilt was passed back and forth; each friend adding another finishing touch until it was finally declared a masterpiece of incomparable design and was quilted and bound. It now greets our customers for FLAMINGO DAYS at our annual PINK sale in honor of Marsha's birthday on July 6th, after which it must go back into our temperature controlled, heavily guarded archives until next year. Like all great works of art, you really need to see it in person to appreciate it's majesty. During today's PINK sale, enjoy 20% off any regular price PINK items! Fabric, notions, books, patterns, select kits, if it has even a smidge of PINK, it's 20% off today only! PLUS, I'm going to let you in on a little flamingo days secret: All of our sale fabric (look for the red dot sticker) will be marked down from $5.99 per yard to $2.99 per yard through the end of the day today! Stop in for lots of flamingo fun and while you're here, be sure to wish Marsha a happy birthday! 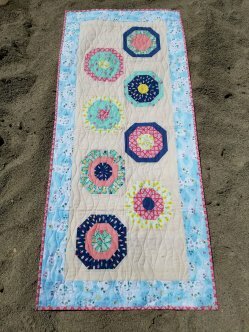 Did you miss the chance to pick up a kit for our Utah Shop Hop "Life's a Beach" table runner? Our Pink sale is the perfect opportunity! Emily Herrick designed this pattern to look like beach umbrellas on the sand! With a closer look you'll see fabrics that feature beachy things like popsicles, pineapples and our favorite feathery friends - - FLAMINGOS! This kit will be on sale for 25% off today during our PINK SALE! It includes the pattern and fabric for the top, binding and even a darling pieced backing all packaged in a sand pail! I can just imagine this quilt hanging on a clothes line in a fresh summer breeze. 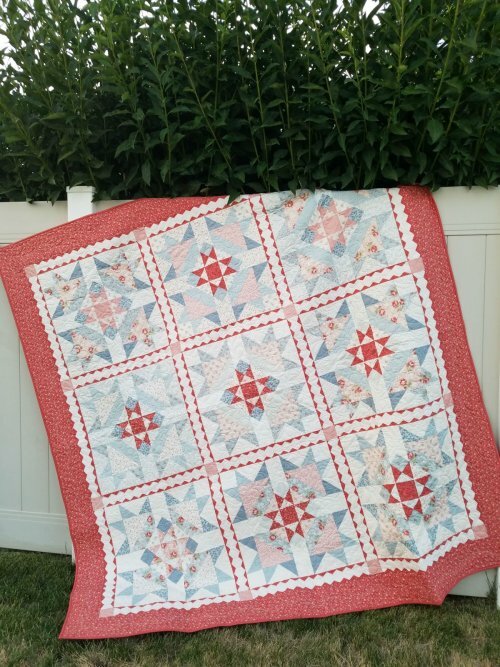 The Victoria quilt by 3 Sister's Designs features soft blues and rose pinks in delicate floral patterns. A hexi print is a clever way to give sashing the look of tiny pieced triangles! This beauty was pieced by Suzanne Adams and quilted by Ramona Sorensen. We have kits and since they have more than a touch a pink, they will be included in today's 20% off PINK SALE! July 9th - 25% off regular price KITS! Some exclusions apply. Block of the month kits not included in this sale. Learn all the basics of quilt making as Stacey Giles guides you through the process of making the Triple Treat Petite quilt. In this class you will cover the essentials such as fabric selection, fabric preparation, using a rotary cutter, seam allowance and seam matching, proper pressing, and even binding! 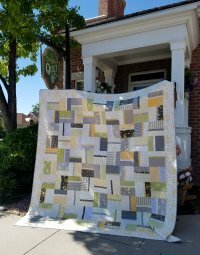 The Triple Treat quilt is a perfect beginner project with easy, large-scale blocks that will allow you to practice the skills you learn without being overwhelmed. You choose the size (baby, lap, twin, full…) and Stacey will teach you how! This class is for beginning quilters who are already comfortable using their machine. Class participants must be 16 years or older. We would be happy to help you select your own fabric choices at the shop. Sign up on our website or at the shop.